NOVEMBER 28—The BVI Athletics Association is gearing up to recognize its athletes who made national teams during the 2012 season, when it holds its fourth Athletes Awards Recognition Gala on Friday, December 28. A record 71 athletes represented the territory in competitions this season and all will be invited to the event, where the division awards will be presented as well as the association’s partner Sol, presenting awards to athletes establishing National Records during the season and the Sol Athletes of the Year in Youth, Junior and Senior Divisions. 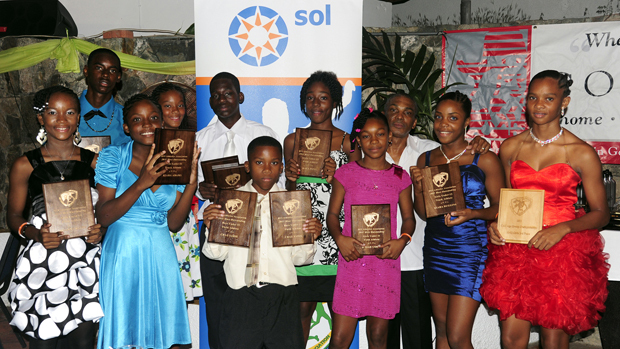 Including relay teams, some 21 athletes were part of National Record performances at the Youth, Jr. and Sr. levels and will be collecting awards from Sol. Lifetime Achievement awards will be presented to the territory’s 16 track and field Olympians who have gone to the quadrennial event between 1984 and 2012. Following is the list of athletes who represented the territory in regional and international competitions. Some athletes were on several national teams and are only listed in the first competition in which they participated. Events such as the IAAF World Indoor Championships, CAC Jr. Championships, Leeward Islands Jr. Championships, World Jr. Championships and the London 2012 Olympic Games, had athletes who competed in other competitions. CUT Games: Izariah Frett, Kaelyah Liburd, Abriel Magloire, Aryia Smith, Kyron Walwyn, Sha’el Lavacia, Tahj Emmanuel, Carlyiek Benjamin, D’Neigh Williams, Tashira Edwards, Zara Brown, Dominique Moses, Koen Penn, J’Quaan Smith, Arianna Hayde, Zahkaria Frett, Shamoi Dore, Z’Niah Corea, Beyonce DeFreitas, Naya Penn, Mikkel Bassue, Jelani Norman, Rakeel Jack, Chaz Fahie, Dauntae Scatliffe, Kala Penn, L’Tsha Fahie, Sh’Kaida Lavacia, Dekoya Hodge, Chelsea Flax-Solomon, Destiny Samuel, Rikkoi Bratwaithe, Khoy Vanterpool, Kcei Moses, Samory Romney, Tahj Malone, Kadeon Potter, Eduardo Vargas.